Crossing Somerset and Mercer County's Truss Bridges ~ The History Girl! There is a certain romantic feeling when traveling over a narrow, one-lane truss bridge. It often stirs feelings of a rural setting. Beginning in the late 1800s, truss bridges became a popular type of bridge to be constructed across New Jersey. Over time, a good number of them were replaced by larger, more modern structures that could hold increased weight limits. Despite losing a significant number of these bridges, many still exist in the more rural counties of northern New Jersey and along the Delaware River Valley. This article will briefly examine the truss bridges in Somerset and Mercer Counties. In the last few decades of the 1800s, metal truss bridges surpassed wood and brick structures in popularity throughout New Jersey. Metal truss bridges remained popular through the early twentieth century because they were inexpensive and easy to build. A truss bridge is constructed of many individual pieces, known as members, acting in tension or compression to perform together as a unit. The members are usually arranged in a repeated triangular pattern because the shape is resistant to stress. Engineers as well as other innovators came up with a large variety of patented designs which were then sold by agents across the nation. These bridges were built by bridge building firms. These firms fabricated the bridges in modular sections at their factories and then transported them to the bridge construction site. The bridges were then assembled on stone abutments and piers built by local masons. Usually, early metal truss bridges were constructed of cast iron and had pinned connections. In the 1890s, steel surpassed iron in popularity in bridge construction and riveted connections replaced the pinned connections. All truss bridges can be classified as a deck, pony, or through truss. A deck truss is a bridge in which the roadway is carried on top of the structure. Both the pony truss and the through truss carry traffic between the parallel iron or steel superstructures. The through truss has cross bracing at the top, over the roadway, while the pony truss does not. Truss bridges can be broken down further into three distinctive types developed by engineers. The Pratt truss bridges use diagonals between the vertical members to form its characteristic V-shape. The Pratt design was developed by Thomas and Caleb Pratt of Boston in 1844. In 1848, the Warren truss was designed by James Warren and Willoughby Monzoni. Warren trusses are composed of either equilateral or isosceles triangles connecting the top and bottom members. Somerset County also features a lenticular truss bridge, one of only a few in the country. This bridge type was developed by Friedrich August von Pauli in 1865. This style of bridge design has a characteristic lens shape, which is achieved with opposing arches. The lenticular truss is known for its flexibility, which is sometimes felt by vehicular traffic. Examples of the common bridge types found in New Jersey. Mercer County, sharing a border with the Delaware River, seems like a logical place for truss bridges to be constructed. A number of truss bridges still cross the mighty river and for the purposes of this article, I will examine one bridge crossing the Delaware River, one in Trenton that is now the centerpiece of a park, a rehabilitated bridge on the border of Lawrence and Princeton Townships, a controversial plan that ended in the removal of a historic bridge along the Washington Victory Trail, and a new truss bridge constructed in Lawrence Township. Since the 1700s, people have been crossing the Delaware River at Washington's Crossing. On the night of December 25 - 26, 1776 General Washington and his troops crossed the icy Delaware River. By the early 1800s, the area would be known as Taylor's Ferry. On February 14, 1831, an act was passed by the New Jersey Legislature and concurred by the Pennsylvania General Assembly, creating the Taylorsville Delaware Bridge Company. The original bridge at this location was constructed beginning in 1831 and was completed in 1834. Its six spans rested on five piers made of rubble stone-faced masonry and two abutments, giving it a total length of 877 feet. The first bridge remained until it was swept away by the flood of January 8, 1841. A new bridge was constructed shortly afterward and remained until it also was carried away by a flood on October 10, 1903. In 1904, a double-intersection Warren through truss bridge was built, utilizing the original 1830s stone piers and abutments by the Taylorsville Delaware Bridge Company. The bridge's deck width of 15.1 feet makes this bridge difficult to cross for even a compact car against oncoming traffic! The cantilevered, wood planked pedestrian sidewalk on the south side of the bridge was added in 1926. All six spans were damaged during a flood on August 19, 1955 and the bridge was closed for about three months. Since then, the bridge has been closed numerous times due to high flood waters and minimal damage. The bridge is currently owned and operated by the Delaware River Joint Toll Bridge Commission. South of Washington's Crossing, in the City of Trenton, is the Jackson Street Bridge. This Pratt through truss bridge was built by the New Jersey Steel and Iron Company in 1888. It was fabricated in the Trenton rolling mill built by Cooper and Hewitt in 1845. The bridge bears two plaques on each side, one indicating the bridge maker and year of construction; the other has the names of committee members Moses Wilkes, W. J. Bowers, and A.B. Walton, director J. Coxon, and engineer W. Anderson. Today, the bridge is surrounded by Mill Hill Park, but when it was built, the area surrounding it was quite different. By examining Sanborn Fire Insurance maps from 1890, the area surrounding the bridge was a neighborhood filled with brick row homes, shops, and mills. During the capital city's redevelopment and urban renewal efforts in the late twentieth century, the area surrounding the bridge was closed to vehicular traffic, the old buildings were torn down, and the bridge became a centerpiece for this park. The area surrounding the bridge is also significant as it served as part of the battlefield during the Battle of Trenton. A significant portion of this battlefield, between Front and Livingston Streets, and Broad and Montgomery Streets is now within the borders of Mill Hill Park. The Province Line Road Bridge is located on the border of Lawrence and Princeton Townships. This riveted Warren pony truss is the longest of three surviving in Mercer County. It was fabricated by Berlin Construction Company of Berlin, Connecticut in 1903. The Berlin Construction Company built riveted Warren trusses into the 1920s. The bridge is comprised of three spans, totaling 140.1 feet. Its deck width is 11.8 feet. According to the New Jersey Historic Bridge Inventory, the existing ashlar piers may predate the bridge. Province Line Road once served as the boundary between the East and West Jersey, but the road has lost its integrity due to modern development. The portion of Province Line Road where the bridge is located was closed to vehicular traffic in 1981 and quickly became a favorite of pedestrians and bicyclists. In 2012, Mercer County took the initiative to rehabilitate the bridge for continued recreational use. While working on the bridge on July 25, 2012, a spark from a worker’s torch smoldered and set the wooden decking on fire. It was not noticed until after the workers had left the job site by a pedestrian. The fire was quickly extinguished before the bridge suffered significant damage. Work performed during the rehabilitation included the removal and replacement of the timber wood deck, removal and replacement of the stringers, repair and re-pointing of the substructure, rehabilitation of the wing wall, painting of the trusses and floor beams, rehabilitation of the steel trusses, overlay of asphalt at the approaches, and the installation of approach guardrail and bollards. Unfortunately, not all historic truss bridges can remain in their original location or be rehabilitated to accommodate increased traffic and weight limits. The Jacobs Creek bridge in Hopewell Township, New Jersey, is a wrought iron, six-panel, pin-connected Pratt through truss that was constructed in 1882 by the King Bridge Company of Cleveland, Ohio. The bridge's total length is 75.1 feet and the deck's width is 16.1 feet. It was rehabilitated in 1950. The bridge follows the same path that General George Washington traveled after crossing the Delaware River on December 26, 1776 and the alignment of Bear Tavern Road follows the route that he took to get from present-day Washington's Crossing to the first Battle of Trenton. Jacob's Creek is the only known major stream crossing made by Washington’s army during that march. The route is commonly referred to as Washington's Victory Trail. In the area surrounding the bridge, the topographical features and rural qualities of Jacob's Creek have been retained, and have not experienced much development since the late eighteenth century. On September 24, 2009, Jacob's Creek bridge was closed to vehicular traffic due the constant barrage of vehicles over the posted weight limit using the structure and possibly putting it in danger of collapse. In 2011, Hurricane Irene damaged the bridge's stone abutments. Mercer County proposed a replacement bridge and alignment for the road, which would have a detrimental effect on the rural landscape and character of the area. In response to the proposal, a coalition was formed and worked for a number of years with the New Jersey Department of Environmental Protection, Preservation New Jersey, and numerous individuals and organizations to convince Mercer County to rethink their decision. Ultimately, between September and October 2011, the bridge was dismantled and is expected to be reconstructed at Howell Living Farm in Mercer County. Although this coalition of concerned citizens and history advocates did not achieve its main goal of saving the bridge in its original location, the vigor and spirit of this group should be recognized for their efforts to preserve this small, but significant piece of New Jersey history. Since the bridge's removal, plans for its replacement have been modified so that the new roadway and bridge will be aligned closer to the original and the design will be sensitive to the historic and natural beauty of the area. Despite the loss of numerous historic truss bridges across New Jersey in the past century in favor of more modern structures, new truss bridges are still being built across the United States, paying homage to the romantic idea of a bridge crossing a small stream or brook in the woods or rural area. One such example of a new truss bridge is the Shipetaukin Creek Bridge on Fackler Road in Lawrence Township, New Jersey. This modern truss bridge was built in December 2002 by Dopp & Dopp Associates. It replaced an earlier four panel pin-connected Pratt pony truss bridge built in 1896 that had been closed to vehicular traffic. Although the bridge is not historic and is not the correct width for a truss bridge, it helps motorists recognize the aesthetic sensitivity of designers and the historical setting in which it was placed. Somerset County has a number of truss bridges, some historic, others new. For the purposes of this article, I will examine one well-preserved example in Neshanic Station, an abandoned bridge, and a hybrid truss bridge that is newly constructed but utilizes rehabilitated historic fabric. The Neshanic Station Bridge in Neshanic Station, NJ spans the south branch of the Raritan River. This bridge is one of only two known lenticular truss bridges in New Jersey. It was built by the Berlin Iron Bridge Company in 1896. The Berlin Iron Bridge Company was the exclusive builder of the elliptical or parabolic truss. In 1889, the company claimed to have built over ninety percent of the iron highway bridges in New York and New England between 1879 and 1889. The Neshanic Station Lenticular Truss consists of two 141 foot spans across the river and is only thirteen feet wide. According to the Historic American Engineering Record for this bridge, plans for stiffening the bridge were proposed by the Somerset County Board of Freeholders in 1932. The project altered the appearance of the portals and added new steel sections to other structural members, but did not significantly change the bridge's appearance. Since 1932, the bridge has been rehabilitated in 1984 and most recently in 2007. The railings on this bridge are original and feature a small flower design, which gives this bridge a unique character. A builder's plate at each end proclaims its construction date and builder. This is one of the most beautiful truss bridges because of its integrity and natural setting. Only a few hundred yards from the Neshanic Station lenticular truss bridge is the Neshanic Station Railroad Bridge. This six-panel metal pinned Pratt through truss, stationary bridge was built in 1896 and carried the Black River and Western Railroad, now defunct. The bridge has two main spans, just like its sister bridge to the north. The bridge sits abandoned and the tracks leading up to it on either side have been removed. Not far from the Neshanic bridges is the Opie/River Road Bridge in Branchburg, New Jersey. The original two span bridge at this location was built by the Dover Boiler Works in 1921 and was a rare example of a rivet-connected Pratt truss bridge. 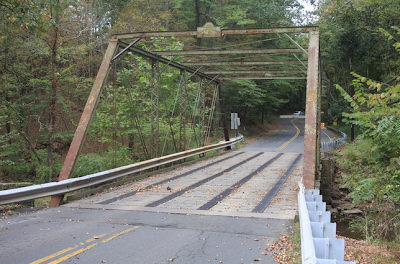 It was the only surviving rivet-connected Pratt pony truss in Somerset County. The original bridge was 18.2 feet wide. In 2005, the bridge was dismantled and the roadway was widened. Somerset County erected a new truss bridge with a concrete deck utilizing the rehabilitated truss members from the original bridge. The floor beams were replaced and large amounts of strengthening members were bolted into the original truss metal. Many of the original rivets were replaced with bolts to allow the bridge to accommodate the wider roadway. Despite the efforts to retain the appearance of the original bridge, the widened road, now twenty-eight feet wide, detracts from the overall allure and historical accuracy of what was once a one-lane pony truss bridge.